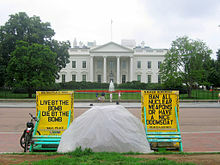 The White House Peace Vigil is an anti-nuclear weapons peace vigil started by William Thomas in 1981. Thomas believed it to be the longest running uninterrupted anti-war protest in U.S. history. After Thomas's death in 2009, it was maintained around-the-clock by Concepcion Picciotto until her death in 2016, and also by other volunteers to prevent the vigil from being dismantled by authorities. Thomas launched the anti-nuclear vigil outside the White House in Lafayette Square, Washington, D.C. on June 3, 1981. He was later joined by Concepcion Picciotto in August 1981 and Ellen Benjamin in April 1984. Over the years various other activists have joined them, including those from the Catholic Worker Movement, Plowshares Movement and Occupy D.C.. It continued to be staffed by activists during Hurricane Sandy in 2012. In 2013, the Peace Vigil was disassembled while it was briefly left unattended. It was restored the same day. Thomas and the White House Peace Vigil inspired U.S. House of Representatives Delegate Eleanor Holmes Norton to introduce the Nuclear Disarmament and Economic Conversion Act, that would require the United States to disable and dismantle its nuclear weapons when all other nations possessing nuclear weapons do likewise. The Congresswoman has been introducing a version of the bill since 1994. The Oracles of Pennsylvania Avenue, a 2012 documentary directed by Tim Wilkerson and commissioned by the Al Jazeera Documentary Channel, recounts the lives of anti-nuclear activists Thomas, Concepcion Picciotto and Norman Mayer. ^ a b Colman McCarthy (February 8, 2009). "From Lafayette Square Lookout, He Made His War Protest Permanent". The Washington Post. ^ Lloyd Grove (December 14, 1984). "Birth of a street person". The Washington Post. 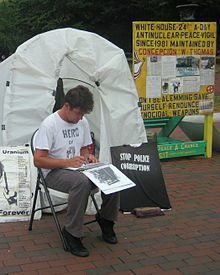 ^ "Thomas, Peace Park Vigiler and Antinuclear Activist". Prop1.org. ^ "Significant Peace Park Vigilers from the Past". Prop1.org. ^ "Current Situation in Peace Park". Prop1.org. ^ "White House Protester maintains 31-year streak despite Hurricane Sandy". Washington Post. Retrieved 2016-01-26. ^ MATT VASILOGAMBROS (September 12, 2013). "White House Peace Vigil Taken Down After 32 Years". The Atlantic. Retrieved September 12, 2017. ^ a b "Norton Files Nuclear Disarmament Bill to Implement D.C. Ballot Initiative". March 19, 2009. ^ Tim Wilkerson (Director) (2012). The Oracles of Pennsylvania Avenue (Documentary). Al Jazeera Documentary Channel. Wikimedia Commons has media related to White House Peace Vigil. 1981 establishments in Washington, D.C. This page was last edited on 31 January 2019, at 15:11 (UTC).